Governor Ducey’s 2019 edition of the State of the State address was aptly themed “Things That Matter.” Speaking for 39 minutes, the governor focused on laying the “groundwork today to make sure that Arizona of tomorrow remains strong.” That requires compromise, planning and – most of all – action. He outlined a number of proposals that transcend party lines – securing our water future, expanding economic opportunity, keeping students safe, investing in public education, preparing Arizona against future downturns and protecting public safety. For government contractors, Governor Ducey has made it clear that Arizona’s economy is “booming” with nearly 300,000 new jobs added during his first term. He is dedicated to finding ways to continue this responsible growth. 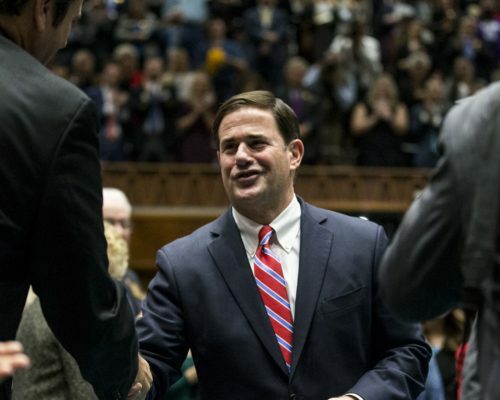 Here are five key takeaways from Governor Ducey’s 2019 agenda. The Governor highlighted the number of regulations his administration has already reduced (over 1,000), and announced his commitment to limited government. He called for Arizona’s licensing boards and commissions to recognize other states’ occupational licenses, allowing individuals from other states to use their licensing from those states to work in Arizona. “If people want to work, let’s let them work,” he summarized. He harshly criticized licensing boards who may object to the change. The governor also challenged legislators to eliminate needless state laws instead of creating new ones. For contractors, this is an opportunity to participate in the process and be heard. The governor pledged to make additional changes to streamline state government and reduce bureaucracy, and called on the expertise of state employees who can guide the state’s use of technology and customer service techniques to further consolidate government. Citing shorter, reduced wait times at MVD offices and the Department of Child Safety operations as a national model, it’s important for contractors to find ways to add value through improved operations. Facing a $1 billion surplus this year, the governor recalled past budget shortfalls, and urged legislators to avoid increased spending. Instead, he pledged to double the amount in Arizona’s Budget Stabilization Fund (sometimes called the “rainy day fund”). The Fund has a balance of more than $457 million, and the governor called on the legislature to designate $1 billion in savings for the future. While we will learn more about the governor’s fiscal plan later this week, it remains important for contractors to articulate why they represent a smart investment. The governor reiterated his commitment to oppose tax increases. The Governor highlighted several successful programs that already exist in Arizona’s community colleges and technical schools, and called for additional investments in CTE programs around the state. Additional details will be available when the Governor’s budget proposal is released, but his office says the plan will include incentives for public schools that produce students in high-demand professions, and additional resources for new and expanded community college programs. It was no surprise that the governor identified this as his top priority, since he has led the call for action on the Drought Contingency Plan. He reminded the legislature that they only have until the end of the month to act on the plan, and called for compromise as stakeholders finalize an agreement. The Governor renewed his call for a school safety plan that would add school resource officers and school counselors, and enact a Severe Threat Orders of Protection (STOP) pathway to prevent individuals who pose a threat from owning guns. He also committed additional funding for an Arizona School Safety Plan, and funding to hire a school resource officer in every school campus that requests one. If you would like to read more about Governor Ducey’s address, you can check out his website. And, stay tuned for Traversant Group’s recap of Governor Ducey’s Executive Budget and ongoing updates from Arizona.